Assail marks the culmination of Esslemont’s Malazan Empire series and is the final chapter of a series that has significantly explored and expanded the narrative universe co-created with Steven Erikson. In this volume Esslemont has set himself a foreboding task in that expectations are always higher for the final novel in a series, even more so if the book is set in the most mysterious land of the fantasy world that has only ever been hinted at. Luckily for readers, Esslemont delivers, although not necessarily in the way some might want. The impetus for the main story of Assail is the revelation that the glacial coverage of the mysterious continent has receded sufficiently that previously impassable terrain is now accessible. In fact, vast gold-fields have been exposed, prompting a mass rush to the land in order to exploit the natural resource. As a result, all manner of people and groups are making their way to and through Assail including Imass, the Crimson Guard, prospectors, private armies, and long absent migrants finally returning ‘home’. Assail focuses on tying up the story of Kyle, the young guardsman first met in Return of the Crimson Guard, the Crimson Guard themselves and the investigation of their mysterious vow. Another significant thread concerns the story of the Imass and Silverfox, which has woven through both Erikson’s Malazan Book of the Fallen as well as Esslemont’s series. Lastly, there are two related threads directly concerning the continent of Assail itself. The first is focalised through the perspective of Orman, a young warrior, and explores Assail from a native’s perspective, playing with perceptions of culture, tribalism, barbarism and honour. The other is split between the various prospectors and outsiders hastening to stake claims and set up frontier stations and explores the foreigners’ perspective of Assail. In particular the story of Reuth, a young navigator tasked with getting his uncle’s ship to the gold fields of Assail. Both the stories of Reuth and Orman parallel one another, while being neat contrasts of the different approaches to life, Assail, and the journey to adulthood. They also create a strong resonance with the story of Kyle, both his introduction in RotCG, and as a reminder that even as one actor’s story ends, other agents in the world will continue. However, each of these potentially disparate tales is interwoven and lends itself to a nuanced and balanced investigation of the continent and its cultures and forms a genuinely cohesive story. Despite the focus on Assail itself as the setting and background of the story, Esslemont has included several sections that focus on the travelling to Assail, most notably the various sea voyages and what that entails for the prospective parties. This brings a significant diversity of story mode, setting and even genre to the book that otherwise might have superficially appeared to be a fantasy travelogue of a Scandinavian influenced continent. Starting with some obvious points that nonetheless need noting. As with the other novels in the Malazan Empire series, the style is once again a narrative told through multiple point of view characters. While several of these characters are key to the narrative, Esslemont also uses witness characters to provide perspective on the events from outside the key actors’ perspectives. As a result there is a pleasing change of perspective as instead of always sitting on a hero’s shoulders, the reader now has access to a broader narrative palette. This is particularly interesting when you consider that this allows Esslemont to demonstrate how the events of the story reach further than just those acting or being acted upon. Such a broadening of scope has the effect of consolidating the world-building (diegetic reality) and adding to the impression that the story-world is ‘real’. It also neatly dovetails with Esslemont’s own background as an archaeologist and anthropologist who sees history as an interlocking system of events and not solely the result of the actions of a few great men. Structurally Esslemont writes true to form with most of the first third of the book being used in set-up and foundational work. He carefully re-introduces old characters (from his previous novels and from the wider Malazan universe) while also introducing some new characters to the story and familiarising the reader with the new setting of Assail. By creating a pleasant blend of the familiar with an enticing mix of the new, the leisurely pace means that no reader is left behind. This is not to say that there aren’t some interesting set pieces and action sequences along the way, but both Erikson and Esslemont are known for their deliberate crafting and building in the earlier chapters of their novels in order to set the board for grand finales. The second third of the novel starts moving the various pieces around as the characters reach and explore the continent of Assail, tracking their interactions and near misses, and building toward the last third of the novel which handles the convergence of events and the resolution of the story and series. It is with the last third of the novel that Esslemont both conforms to and defies his standard structural approach. The last third of the novel contains multiple scenes of battle, action and a convergence of events, but if it is an all-out battle ending that you are longing for, you will be disappointed. What Esslemont delivers is, in almost every way, far more satisfying. He brings home multiple story threads and characters from throughout the series in an emotional and narrative convergence that provides a sensitive and resonating narrative closure. While this is probably something of a risk for Esslemont given the desire in many fantasy fans for blood, gore and battle by the ever increasing bucket full, that he pulls it off should mark his increased prowess and command as an author. It is of no surprise that the world of Assail is exquisitely realised. In Blood and Bone Esslemont depicted the sweaty, steamy closeness of a jungle landscape with such clarity that it became a character in and of itself that was integral to the story. In Assail, the various landscapes, climates and scenic types deployed by Esslemont are rendered in a beautiful cinematic language that gives a visceral quality to the description and helps lift the narrative off the page. The various landscapes and settings reveal several influences on the book and have been well tied to the various themes and plots running through the volume and series. Notably, the Odyssey and Sinbad inspired sea and sailing sections, in which several different attempts to reach the continent are described and reveal the dangers of even trying to get to this part of the world. The wind-blasted, desolate coastline that emphasises the unwelcoming and foreboding nature of the land, but also the isolationist nature of the population and how cut off this is from the rest of the world. The long rolling prairies and plains of Assail that evoke a sense of Esslemont’s Canadian homeland, a land that appears lush and welcoming, but has hidden dangers, and, like the beaches, emphasises the unwise and unwelcome intrusion of people into a world and space that does not want them. But it is with the Alaskan and Scandanavian inspired mountains and glaciers that the book really finds a defining landscape that evokes the true nature of Assail. The terrible beauty of the biting cold, the virgin forests filled with snow, the blues, greens and whites of glacial flow. This is a harsh, pitiless, unwelcoming world to the human invaders, but a beautiful, sublime home to those people who live in concert with the land. Each of these landscapes has been rendered with an eye for cinematic description that evokes the transcendentalist sense of nature’s beauty, as well as the brutal reality of inhospitable climes. This descriptive backdrop neatly fits with the detail of the wider world which is also superbly rendered, in part due to the early books in the series, but also due to Erikson’s Malazan Book of the Fallen series which features the same world. By building on what has gone before, and assuming the reader’s foreknowledge of the world, Esslemont has been able to focus on what lies directly around the characters and this has led to a style that creates a perception of the fictive reality as something witnessed and existing, without needing to utilise endless exposition or overly-long descriptive passages. The assumed knowledge is not necessary to enjoying the story as it unfolds, but it does add significant depth, breadth and colour to the story that uninitiated readers might miss. As the narrative builds on this realised world and weaves the characters and their actions into it in order to build a cohesive story that reads and feels ‘real’, ultimately, it results in an immersive reality that the reader witnesses through the perspectives of the various point of view characters and creates a believable, solid weight to the story world that helps sell the more fantastic elements. Given that the impetus of the story is based on the revelation of suddenly accessible gold-fields, and that the glaciers have retreated and exposed hitherto impassable sections of this relatively pristine land, there is a strong element of the frontier gold-rush myth to some of the storytelling. While frontier stories are not that uncommon, the parallels to the current attitudes to exploiting natural resources in Canada and the US certainly form a strong undercurrent to this aspect of the story. Esslemont’s description of the frontier mentality has far less of the noble mythos that has surrounded American gold rush stories, and presents a vicious reality about the unscrupulous plundering of natural resources over the objections of natives and indigenous inhabitants. There is a strong suspicion that his experience of current mining and oil drilling in Alaska may have influenced some of the elements in the story. The matter-of-fact destruction of natives and native environments by outsiders, in the name of progress and financial greed, is contrasted and compared to the tribal conflicts of the native inhabitants perpetrated on one another in the name of tradition and blood feuds, which are anything but dispassionate. Esslemont succeeds in creating a credible series of tribal cultures and relationships that balance the tropes of the barbarian and the noble savage with a more objective perspective in an attempt to convey the complexity of tribal and clan societies without overly venerating or damning them. These violent, destructive story threads are held up in comparison to the logical extension of their core premises in the story of the Imass and their genocidal pogrom sweeping through the land in an effort to cleanse a perceived racial taint. As a series generally conceived of as high fantasy adventure epic, these are weighty, divisive and loaded issues that one would not expect to find. However, part of Esslemont’s talent as a writer is to weave these contemporary concerns into his fantasy narrative seamlessly and make them appear as part of the very fabric of the fictive reality. Not only that, but many aspects of these issues are presented without authorial comment or overt bias, letting the reader absorb the facets of the conflicts and appreciate the factors that led to characters making these decisions. There are few obvious antagonists or villains in the story. Indeed many of the foes faced by the characters are sympathetically or realistically presented in an effort to show the moral complexity of world, while the characters themselves are not always on the side of ‘good’. Assail is a book of characters, not a book of heroes and villains. By not directly signalling good or evil, and steering clear of fetishizing violence and idolising dark anti-heroes it may be that Esslemont has created too realistic a moral universe for his readers and some will overlook the actual complexity of morality at play. Over the last few years Esslemont has faced significant and vicious criticism from many fans of Erikson’s Malazan series. His work has been viewed or even dismissed as a companion piece to the real series. His portrayals of characters and places in the world have been dismissed as less than authoritative. His strengths as an author have been overlooked and his weaknesses have been exaggerated. Despite this, Esslemont has continued to produce fantasy novels that exemplify the best that fantasy series have to offer and has continued to improve as a writer, an author and as a storyteller. 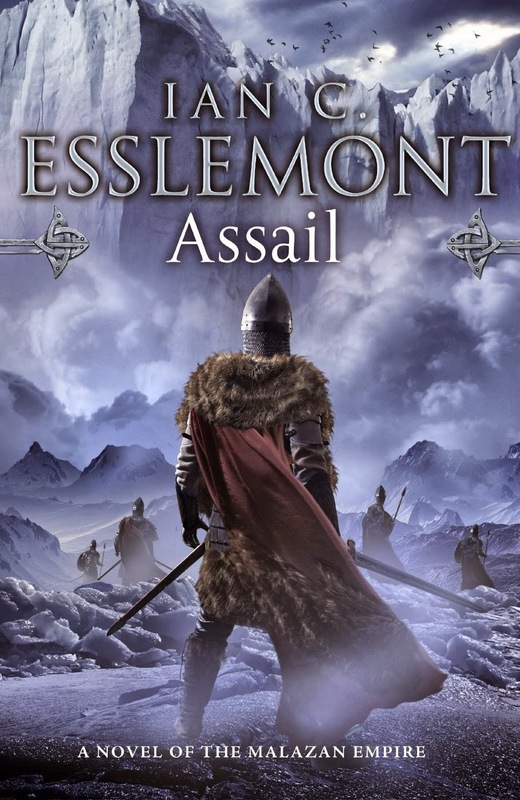 With Assail Esslemont has written a fascinating, thoughtful, exciting and engaging read. It is a fitting finale to the Malazan Empire series, and a great book. He masterfully weaves myth, legend, character, land and story together to create something that fulfils expectations but remains engaged with concerns of our own world. He has always stood shoulder to shoulder with his co-creator, Erikson, but perhaps now he himself will believe it. This entry was posted in Review and tagged Assail, Fantasy, Genre, Ian C. Esslemont, Malazan, Review, Steven Erikson. Bookmark the permalink.